But in this first epistle, he was writing against a group of people called the Gnostics. He wanted to make sure the teachings of this heretical sect were not allowed to take root in the church. I studied Gnosticism briefly almost 50 years ago. It wasn’t a real in-depth study – more of a familiarization with their teachings. And it never occurred to me that Gnosticism would rise again. The Da Vinci Code, written by Dan Brown in 2003, is in part, about Gnosticism. We’ll come back later and discuss what that is and how to address it very simply. I want to use what is written in this book and seen in the DaVinci Code movie that came out on May 19th, 2006. Let me ask you, “How many of you have read Dan Brown’s book The DaVinci Code?” In a crowd like this, we may tend not to read a book that trashes our Bible. But this is one of the most-read books around the globe today. In America alone, they estimate between 80 – 100 million people have read the book. That’s one out of ever three. In 2005, TIME magazine named Dan Brown one of the world’s 100 most influential people, among the likes of President George W. Bush and the Dalai Lama. Dan Brown says in his book, The da Vinci Code that the Bible is not of divine origin, but human. I would not get so concerned if the book was read for the fiction that it is. But on page 235, he says, “Almost everything our fathers taught us about Christ is false.” Brown tries to prove that the four Gospels, as we know them, were not the original gospels in the New Testament. Matthew, Mark, Luke and John, according to Dan Brown, replaced earlier ones for political reasons. Dan Brown claims that nearly everything in the book except the characters is authentic. In the introduction of the book, Brown says, All descriptions of artwork, architecture, documents and secret rituals in this novel are accurate.” His book is a platform from which he can give his convictions about Christ. He believes that Jesus was only human, and the church treated Him as only human for its first 300 years. He was also married to Mary Magdalene, and they had a child by the name of Sarah. The Da Vinci Code was number one on Amazon.com, and a New York Times bestseller for 32 weeks. Non-Christians have been drawn to the theories Dan Brown presents as facts. Even Christians have said their faith has been shaken. As for the title of his book – The Da Vinci Code – Dan Brown believes Leonardo included codes in his art work to discredit the church. Dan Brown: “Leonardo was one of the keepers of the secret of the Holy Grail, and he hid clues in his art.” (Page 230). Although Leonardo did paint some Christian art, that was not what he was known for in his day. He did not have hundreds of lucrative Vatican commissions. He had only one – and he never executed that one. I hope you also know that Leonardo never went by da Vinci when he was alive. The village of Vinci, in the Tuscany part of Italy, is the birthplace of Leonardo. It is north of Rome and due west of Florence. The core of our lesson is about the Bible, not Leonardo’s art work. But let me quote Jack Wasserman, retired art professor and expert on Leonardo da Vinci from Temple University. Again, this lesson will focus on the current Gospels and whether they were added later to take the place of, according the Dan Brown, the original and earlier gospels. I will not be, during this lesson, addressing other fallacies of Brown concerning the divinity of Jesus Christ. I will just say that I believe the non-gospel books of the New Testament reflect the same view of Christ’s divinity that the current Gospels do. Therefore, it was the not the changing of the gospels that took Jesus from being human and married to being divine and fully God. There are many historical errors which Dan Brown includes in his book, But what he says about the Bible is exceedingly more important for us to know. Dan Brown’s thesis is this. He says that in the Council of Nicea in 325 AD, Constantine called the church leaders together so that he could “commission and finance” (that’s his phrasing) a new Bible. He goes on to say that what Constantine did was to take the original gospels out of the Bible, destroy them, burn them, and put in its place Matthew, Mark, Luke and John. Why? Because, Dan Brown says, they made Jesus look “better” - particularly the “divinity thing.” It pumped Jesus up. That would give the church more authority, and he (Christ) had authority over the church, and it would make it easier for him to politically manage the whole empire. This one is frankly preposterous – but we need to address it. Where does he come up with these thoughts he states as being facts? 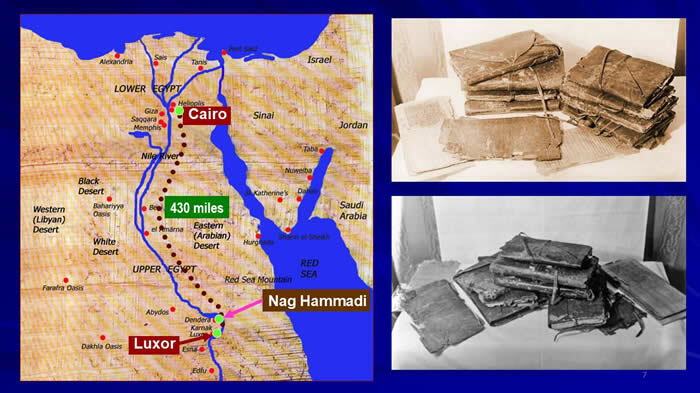 In 1945, in Egypt, in a little town called Nag Hammadi, they discovered some documents. These were translated into English in 1977. In 2003, a group of us took a trip to Egypt, Israel and Jordan. On one leg of the trip, we took an overnight ride by rail from Cairo to Luxor, where we visited the Valley of the Kings. We also visited the temples of Karnak, which were an impressive set of ruins. I didn’t realize it at that time, but while we were in Luxor, we were only 30 miles from Nag Hammadi. In Nag Hammadi, they found about 52 gospels. Dan Brown says they found about 80 gospels. They didn’t, they found 52. Dan Brown also says they were written in Aramaic. They weren’t – they were written in Coptic. He says they were in scroll form. They weren’t. They were in book form. Many details he managed to miss. Now, here’s what’s wrong with the whole thesis of Dan Brown that those were the original gospels and that Constantine did a switch. Let’s establish the actual time line. When was the gospel first documented in writing? What year - approximately? The first statement of the gospel was somewhere in the early 50’s AD. And it may not have been by Matthew, Mark, Luke or John, but by the apostle Paul. Setting aside the gospels for a moment, let us look at the apostle Paul and what he wrote. Let’s examine what he writes about the gospel of Jesus Christ and who may have influenced him. But first, I want to establish some approximate dates in the life of Paul. Paul, when he was Saul, appears to have been present at the stoning of Stephen, the first martyr of the baby Christian movement. Most historians and theologians date the stoning of Stephen about 2-3 years after the crucifixion. If you accept that Christ died between A.D. 30-33, it would put the death of Stephen at about A.D. 34-35. Most early Christian writers and current historians see Saul’s encounter with Christ on the road to Damascus quite soon after Stephen’s death. This would put it following A.D. 35. 17 nor did I go up to Jerusalem to those who were apostles before me; but I went to Arabia, and returned again to Damascus. 18 Then after three years I went up to Jerusalem to see Peter, and remained with him fifteen days. According to Galatians 1:17, we are told that Paul went to Arabia following his encounter with Jesus. We do not know how long he was in Arabia or why he went there. After his time in Arabia, the verse we just mentioned, says he returned to Damascus. Then, in Verse 18, we are told three years passed before he went to Jerusalem. This could have occurred somewhere between A.D. 39 and the mid-40s. All recognized scholars and non-Christian historians agree that the apostle Paul was a first century figure. They all agree that this apostle died at the hands of Emperor Nero probably in A.D. 66. Since the life and ministry of Paul overlaps the historical beginnings of the Christian movement, he is the most historically dependable window into the faith of the earliest disciples of Christ. So let’s examine the writings of the apostle Paul as it relates to the gospel of Jesus Christ. We will also see who may have had some influence in his life. If you accept, as I do, that the book of Romans and Hebrews was written by Paul, his writings account for 14 out of the 27 books in the New Testament. Though he was a prolific writer, the apostle Paul never mentions these “original Gnostic believers.” The historicity of the apostle Paul and his writings completely undermine The Da Vinci Code’s view of things. Paul said that he depended on those who were apostles before him, and specifically named Peter, John and James, the brother of Jesus. Let’s read some of what the apostle Paul wrote about the gospel of Jesus Christ. Paul, in 1 Corinthians 15:3-4, says “this is the gospel, that Christ was crucified, buried and resurrected on the third day just as the Scriptures said He would.” That is the earliest documentation of the essence of the gospel to be recorded. All liberal and conservative scholars agree (and they agree on very few things) that Paul wrote all his letters somewhere between 50 and 64 AD. Paul, in the early 50s, documents the essence of the gospel (some say as early as A.D. 50). He is in Ephesus, during his second missionary journey, and he is writing back to the congregation he started in the city of Corinth. 2 by which also you are saved, if you hold fast that word which I preached to you — unless you believed in vain. He documents the essence of the gospel. He goes on to say he learned it from others, and in the following verses he names some of the early followers of Jesus. And in there, He describes the essence of resurrection of Jesus Christ. He (Paul) was a contemporary of Jesus – alive when Jesus was alive. He certainly didn’t follow him during Christ’s earthly ministry. He followed him later. But he says, “I learned all of this from those that did follow Him when He was here.” Who are those who Paul learned from? Does he mention any of them in his writings? If so, does he mention any Gnostics. 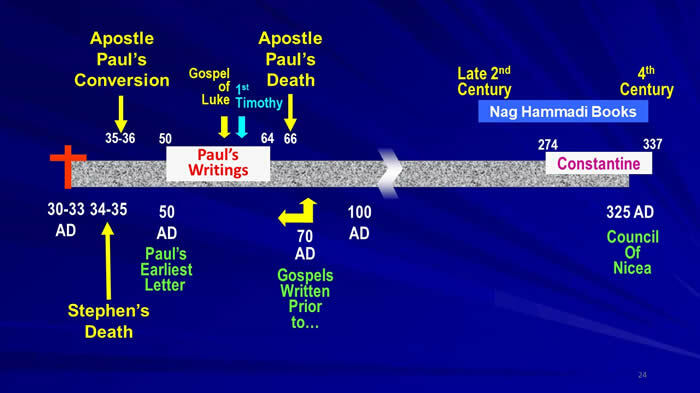 As I stated earlier, from a historical setting, the writings of Paul become a backbone of the New Testament. His life is the most historically-dependable window into the faith of the earliest disciples of Jesus. If there were other gospels written that predate the four we have in our Bible today, certainly Paul would have mentioned them. Dan Brown and others would have us believe these other gospel, known as the Gnostic gospels, were written earlier and show Jesus as a great, but human spiritual leader. Again, who are the ones Paul learned from? He doesn’t mention many of them by name, but enough to give us a hint about the earliest days of Christianity. In 1 Corinthians 9:5, Paul mentions, “the other apostles, the brothers of the Lord (James, Jude, Joseph [Joses] & Simon), and Cephas (Peter). Calling him Cephas (which is Aramaic) rather than Peter could indicate an early date, because he is almost always called Peter, with Cephas dying out very early. In Galatians 1:19 (NKJV), Paul relates a time when he was in Jerusalem. 19 But I saw none of the other apostles except James, the Lord's brother. In Galatians 2:9, Paul refers to James, Peter and John as being pillars of the church, and mentions that they gave him and Barnabas the “right hand of fellowship.” That is, they were foundational, eyewitness figures on which Jesus built the church. It was from these men that Paul had received the original gospel. If any historical person was in a position to identify what the original faith of the church was and what the original founders believed about Jesus and the Scripture, it was Paul. In 1 Corinthians 15:11, Paul says that what he preached was what these original founders preached. In other word, what Paul preached was what the earliest churches believed. If anyone would have known about other documents, it would have been Paul. Paul was a Harvard graduate of his time. He was brilliant, and an incredible scholar. If anyone would have researched that, Paul would have. Not one reference anywhere to such a thing occurring. Why? Because it didn’t happen. NOW, WHEN WERE MATTHEW, MARK, LUKE AND JOHN WRITTEN? WHY DO WE KNOW THAT? They are giving eye-witness accounts of events centered in Jerusalem and up in the Galilee region. Now, in Jerusalem, where are they centered there? Often it was the temple. This is why we know they were written before 70 AD. In 66AD, the Roman army got fed up with the Jews. They said, “You guys are creating such a problem, we’re going to come in and smash you ”, and so they did. The war broke out in A.D. 66, and the siege continued until A.D. 70, when they destroyed all of Jerusalem, and they burned the temple. According to some historical records, it kind of looks like they didn’t intend to burn the Temple, but it caught on fire and they couldn’t put it out. What happened is quite fascinating. As the fire was burning the temple, all the gold liquefied and ran down between the stones, and the Roman soldiers, later, dug stone for stone to get all the gold out, and thus, Jesus’ prophecy was fulfilled, where He said, “Not one stone will be left on the other” (Matthew 24:2). That’s actually how it happened. The truth of God’s Word is proved over and over again. Christ had made that prophesy some 40 years earlier. So, Matthew, Mark, Luke and John are written some time before 70 AD. If we have time today, I will show that the synoptic gospels were probably written from late 50’s to early 60. It is possible that the gospel of John may have been written about that time, but there are some historians who date it later. And there are many who date Matthew in the 40’s. The Bible is the best-selling book in the history of publishing. It has been translated into thousands of languages and is read by millions every day. Yet, if what The Da Vinci Code says about the origins of this book are true, that it is written by mortal men and not of God, .then the Bible is not the inspired Word that reveals the Creator to his creation. And, by the way, there are many who would agree with Dan Brown’s assessment. So, is the Bible fact or is it fiction? I probably should make at this point a very important statement. We, as Christians, never need to be afraid of the attacks of the enemy. The Bible has stood the test for some 2000 years, and even more for the Old Testament. Philosophies have tried to intellectually discredit the Bible and Jesus Christ. Kings and nations have tried to erase any trace of the Bible by destroying every copy they got their hands on and killing those who would dare make new copies. We do not need to fear entering the arena of reason where truth is discussed. The Bible, which I believe is the Truth, can stand the test of the most intense scrutiny. We will examine that more fully in a later lesson. In the Council of Nicea, in 325, the Emperor Constantine did call for the church leaders to get together. And they did discuss, and affirm what the church had been preaching from day one, that Jesus was God – always divine. But they never at all discussed at that council what should or should not be in your New Testament. It wasn’t dealt with at all. Dan Brown is dead wrong on that issue all the way round. The documents he is so in love with, called the Nag Hammadi discoveries, were not written until the late 2nd, 3rd and 4th centuries. There are no historians that will disagree with that assessment. Now remember, Dan Brown says there were 80 gospels. There were only 52. He says they were written in Aramaic – they were written in Coptic. He says they were written in scroll for – they were in book form. Let me make a few statements here. Over the first seven or eight hundred years after Christ, there were no less than two dozen gospels written. Most of them were never intended by their writers to be thought of as Scripture. They are a sharing of the “good news.” A number of them are not heretical writings. Actually good. The Gospel of Gamaliel, a 5th century Christian writing, doesn’t have any heretical statements, and it doesn’t claim, and shouldn’t be thought of, as Scripture. Now back to these 5 Gnostic gospels. The gospels of Thomas and Philip have no connection with anyone mentioned in the Bible with the same name. The Gospel of Philip , a late-3rd century Gnostic Gospel, does not claim to have been written by the apostle Philip. It was given the name, “Gospel of Philip,” because he is the only person mentioned in it. It is in this gospel that Dan Brown refers to as the proof that Jesus had a sexual relationship with Mary Magdalene. In this Gospel is a line that essentially says, “The companion of the Savior is Mary Magdalene.” Dan Brown adds: “Any Aramaic scholar will tell you, the word “companion”, in those days, literally meant spouse” (Page 246). Firstly, the only copy we have of this Gospel is in Coptic, not Aramaic. The Coptic word for “companion” is derived from the Greek words: Koinonos or Koinonia. This is a term that never indicates a marital relationship. This word Koinonos appears 10 times, and the word Koinonia appears 20 times, in the Greek New Testament, with absolutely no hint of a sexual or marital relationship. Another of the 5 Gnostic Gospels is the Gospel of Thomas. When you look at the Gnostic Gospels, and I have read a number of them, they are not an historical narrative, like Matthew, Mark, Luke & John, which give a sequence of events and activity. The Gnostic gospels describe almost no events. They are simply collections of sayings, much like the book of Proverbs. The Gospel of Thomas contains 114 sayings attributed mostly to Jesus, but no narrative of anything He did. It is actually a short writing, which you could read in 5 – 10 minutes. Many of the statements made I have no problem with. A few are very similar to statements of Christ, recorded in the biblical Synoptic Gospels. But most of the statements attributed to Christ are an early form of Gnosticism. Remember, Gnosticism did not believe Jesus to be divine, only human. So, what about the claim by Dan Brown that the original gospels were the Gnostic gospels, and were later replaced by Matthew, Mark, Luke and John in the 4th century. This is where Dan Brown has really not done his research or homework. The question becomes this: Is there any evidence that the 4 gospels we have were not only written earlier, were they used as Scripture by the church earlier than the 3rd century? Additionally, what did the “early church fathers” have to say about the New Testament Canon? I probably should add that more commonly, the early church fathers are called “Apostolic Fathers.” They were apostolic in that they were faithful in teaching what the apostles taught and wrote. And they were “fathers” in that they led the early beginnings of this infant church. Earlier I mentioned that the gospels most assuredly were written before 70 AD. Most Bible scholars now believe they were written prior 60 AD. There are some who date the gospel of John later, but many give it a date of about 58AD. And probably the other three gospels were written prior to the gospel of John. How early do we have a record of the gospels being considered holy Scripture? First let’s look at some internal evidence. 17 Let the elders who rule well be counted worthy of double honor, especially those who labor in the word and doctrine. 18 For the Scripture says, "You shall not muzzle an ox while it treads out the grain," and, "The laborer is worthy of his wages." Notice that verse 18 is quoting Scripture. In fact, there are actually two quotes in that verse. The interesting thing is that one quote is from the Old Testament and one from the New. But, both are called “Scripture” by the apostle Paul. IS THERE ANY HERE THAT WOULD LIKE TO INTERPRET THESE VERSES? As you look to interpret these verses, keep in mind that the first word in verse 18, - the word “FOR” – is used as a conjunction, which ties these two verses together. The first quote is taken from Deuteronomy 25:4. Simply stated, let the ox eat while he is working out the grain. Paul is making this with reference to how Pastors and church leaders should be treated. To paraphrase, he tells the church to make sure the pastor is able to eat, while he is preparing spiritual food for them. The second quote is taken from Luke 10:7, which is essentially saying the same thing. What else does this tell us about the gospel of Luke? This quote by Paul also means that the gospel of Luke must have been written and in circulation prior to Paul’s writing of 1st Timothy. So if all Paul’s writings occurred prior to 64 AD, so must the gospel of Luke be even earlier. So, how early do we find evidence for the formation of the New Testament Canon? FIRST, WHAT DOES THE WORD “CANON” MEAN? It comes from the Greek word “KANON.” It is speaking of a rod used to measure things. This Greek word is actually found in the New Testament 5 times. Let me give you just one example. 16 And as many as walk according to this rule, peace and mercy be upon them, and upon the Israel of God. Let me make a few broad-brush statement. As an antithesis to Brown’s version of the Bible’s history, it is my belief that the first generations of the Christian movement stated loudly in their writing, the biblical nature of their beliefs. The word “BIBLE” means “book.” So when I say the early Christians spoke about the biblical nature of their beliefs, I am speaking of a documented canon. For instance, let me quote Ignatius of Antioch of Syria. First, a historical background. Antioch was the third largest city in the Roman Empire, nearing 500,000 people. This is the city from which Paul begins each of his 3 missionary journeys. You can read in Acts 13, where Paul and Barnabas are set apart by the prophets and teachers at Antioch for their first trip. This trip was shorter than the others, and would have lasted from about AD46 to 49. About that time – AD 50 – a child was born in this city with the name Ignatius. He grows to become the leader of the church in Antioch, and because of his testimony and faith in Christ, is taken to Rome for execution. We don’t know exactly when he died, but we know it was sometime around 107 AD. In his short life, he writes a number of letters, 7 of them during the long trip from Antioch to Rome, where he loses his life to the hungry lions. In his writings, he refers to or quotes from 25 of the 27 New Testament books. By stating that, I am not saying that there were not some of the books we have in the New Testament over which there was much discussion, and sometimes disagreement. A few of them took time to be fully accepted by the entire Christian community. But, again I say, the early generations of Christians believed in a canon uniquely inspired by God Himself. And, in their minds, this included not only those in the New Testament, but also the entirety of the Old Testament. And I find it somewhat telling that in critiquing early Christianity, Brown barely makes a mention of the Old Testament. One of the amazing things about this book is that it completely cuts Jesus off from His Jewish roots. If you were getting all your information about Jesus from this book, you wouldn’t know that He is Jewish, except for this bloodline story. The very first day of the church – on the Day of Pentecost in Acts 2 – it is marked by a public sermon explaining the Old Testament Scriptures. The Old Testament was the authoritative source of all they taught at the beginning. Luke, who wrote the Book of Acts, commended the people who lived in the town of Berea because they scrupulously examined the Old Testament to see if Paul’s message could be believed (Acts 17:11). The inspired Old Testament texts are cited hundreds of times all over the New Testament. As an example, there are 85 quotations or allusions from the Old Testament in the Book of Hebrews alone. In the Book of Revelation, there are 245. Every Old Testament Book except the book of Ruth is quoted in the New Testament. Christ Himself quotes from 22 of the Old Testament books. And there are well over 300 Old Testament prophecies that were fulfilled in Christ. Christ taught his disciples that the entire Old Testament taught about Him (Luke 24:27). Paul echoes that thought in Romans 10:4, where he says Christ is the end goal, the final installment, of the Old Testament. To try to develop a New Testament canon that does not consider the Old Testament canon is at best spurious. Though Jesus did not write anything, He made sure there would be those, trained by Him, who would bring His message to the world. Luke mentions the importance of eyewitnesses to what Christ said and did, when he gives an introduction to his gospel (Luke 1:2). Jesus also said that whatever the apostles allowed or disallowed would be allowed or disallowed in heaven. These apostles who spent more than 3 years nearly continuously with Jesus, were given the keys of authority in the kingdom of heaven. It is the writings of these apostles that Brown wishes to eliminate, and yet, it is the foundation of these apostles upon which the church is built (Eph. 2:20). That means they were part of the very foundation of the Church. The New Testament writings come to a close near the end of the first century. John was the last of the eyewitnesses of Christ. As we move into the second century, what do we find in the writings of the second generation of Christians? Do we find evidence of at least the beginning of the development of the New Testament Canon? We have many writings from those living in the late 1st century to mid-2nd century. They will help us understand that the development of the New Testament canon was underway. In our class, we have been studying the second of the 7 churches of Revelation – the church at Smyrna. The leader of this church was Polycarp. He was a student of the apostle John. As the pastor and overseer of this church, his congregation urged him to flee into the countryside in order to escape the persecution of the Romans and others. This was in February, 155 AD. He was hunted down and captured. He did not resist them, but offered them food and drink, and asked for permission to retire for prayer, which he did for two hours. As they traveled into the city, the officer in charge urged him to recant. “What harm can it do to sacrifice to the emperor?” Polycarp refused. On arrival, he was brought before the proconsul in the amphitheater, who pleaded with him. “Swear by the genius of Caesar… Revile Christ. Polycarp said: “for 86 years I have served him, and he has done me no wrong; how then can I blaspheme my king who saved me?” The proconsul persisted: “Swear by the genius of Caesar…I have wild beasts; if you will not change your mind, I will throw you to them…” “Call them!” Polycarp replied. “Since you make light of the beasts, I will have you destroyed by fire, unless you change your attitude.” Polycarp strode to the stake and tells them they need not tie him, because God would give him the grace to stay when the fire was lit. He prayed, “O Lord, Almighty God, the Father of your beloved Son Jesus Christ, through whom we have come to know you…I thank you for counting me worthy this day and hour of sharing the cup of Christ among the number of your martyrs.” And he dies that day. In about 110 AD, in one of his writings, Polycarp not only refers to all four gospels as Scripture, but he mentions and quotes 18 of the New Testament books. You cannot quote what does not exist. These books were in written form and already in great circulation. Polycarp did not write as much as one of his students which I will mention later. He did write a letter to the church in Philippi a short time before his death. I read through this letter again this week. It is not a long letter. Although it has 14 chapters, or sections, each has only a few statements or verses. In chapter 12, he makes a couple of noteworthy statements. His first statement in this section is: “For I am confident that you are well versed in the Scriptures, and from you nothing is hid:…” That tells me he knew enough about the church at Philippi, located in a different country, to know they had received and were well versed in the “Scriptures” (plural). That means they had at least parts of the written Word of God and had it in their possession for enough time to become well-versed in it. He also makes this statement later in chapter 12. “…as it is said in these Scriptures,…” When you look through this entire letter, you find quotes only from what we call the New Testament. That is not because He didn’t believe in the Old. But it confirms that he believed the books from which he quoted were Scripture. In this letter he quotes from or alludes to: Matthew, Acts, Romans, 1 Corinthians, Galatians, Ephesians, 2 Thessalonians, 1 Timothy and 1 Peter. For Polycarp, these writings were the Word of God. Clement of Rome, in about AD 95, writes a letter from Rome to the church in Corinth. It is a fairly lengthy letter, and he uses quotes or allusions to Matthew, Luke, Hebrews, Romans and Corinthians. And since Clement’s letter is addressed by the entire church at Rome to the church in Corinth, it can be assumed that both of these audiences knew these writings. That means these books were widely circulated before AD 90. Polycarp had a spiritual son named Irenaeus. Like Polycarp had sat at the feet of the apostle John, Polycarp passes on to this young man what he had learned from John. Irenaeus becomes a prolific writer during the middle to end of the second century. He was born in 115 AD and died in 202. Irenaeus quotes extensively from the four gospels. In fact, in all his writings, he references 25 of the 27 New Testament books we have today. The only books he does not reference are Philemon and 3rd John, both of which are small, one chapter books. About 180 AD, he writes a book called “Adversus Haereses” - Against Heresies. The full subtitle is: Refutation and Overthrow of Knowledge falsely so-called. This is a voluminous set of 5 books, each having between 31 and 41 chapters. I ask you a question: How does one write so voluminously about heresies unless he has some canon – measuring rod – against which to measure all else as to whether it be true or false. Earlier I said that the early Christians spoke about the biblical nature of their beliefs. And by that I they meant they had written documents, accepted as Scripture. Let me make one more quote by Irenaeus. He uses the very writings that are rejected by the Gnostics. In fact, some of the heresies Irenaeus writes against are the false teachings of some of the earliest Gnostic writers. Their writings were beginning to show up near the mid to late-second century. He takes them to task because they have left the “writings of the evangelists and apostles,” but they instead “derive proofs for their opinions by means of perverse interpretations and deceitful expositions”. This means that a body of written truth existed prior to the Gnostics, which they had taken and perversely twisted in their interpretation of it. Two versions of Christianity did not develop simultaneously alongside each other as The Da Vinci Code maintains. That would mean the church was born in total confusion with no clear earth-changing message. Nor were the Gnostic gospels written and accepted first and later replaced by Constantine. Common sense demands that there was first orthodoxy, cemented by widely accepted written texts produced by the first generation of believers. Then came the deviant version followed by its own set of writings. A written canon existed at the very beginning of the Christian faith. In fact the early church already possessed the Canon of the Old Testament. And as they wrote the New Testament, they were consciously writing, under the direction of the Holy Spirit, the conclusion to the Canon – the fulfillment of the Old Testament. The next generation of Christians received the New Testament this way. Here is another example of the fact that the canon of the New Testament existed well prior to the time of Constantine. The early Apostolic Fathers of the church led the church during the second and third centuries. If all 5,366 manuscripts of the New Testament were suddenly destroyed, it would still be possible to reconstruct the entire New Testament with quote from the writings of these apostolic fathers, with the exception of between 15 and 20 verses. Up to now, what I have tried to present is evidence of early acceptance of the majority of the New Testament books. This was especially so with regard to the four Gospels found in our current Bible. And Brown’s assertion that the Council of Nicea was held in 325 to determine which books should be included is definitely without merit or evidence.